Our plumbers have repairing or replacing water heaters in Huntington Beach/Orange County, California for almost 40 years! The State of California recently passed a new law requiring that when an existing water heater has failed that it be replaced with a new highly efficient water heaters. These new highly efficient water heaters cost about $100 or so more than the previous style but theoretically should pay off over time with a lower heating cost. Clean Plumbing knows which models in which different sizes comply with the new law. Call us at 714-402-7079 if your water heater is on the fritz. Consumer Alert! Proper installation is essentially for insuring that your manufacturer’s warranty is valid! We have a tremendous amount of experience in installing these and we see that a sadly large percentage of installations are done improperly. If you’re in the market for a new water heater and you have large hot water needs you might want to consider a tankless or flash water heater. These heaters heat the water as its needed allowing all of your large family to have a hot shower or making sure your 100 gallon Jacuzzi tub gets completely filled with hot water. Because the Tankless Water Heater can provide on demand, continual hot water you could, if you wanted, take a 2 hour hot shower! 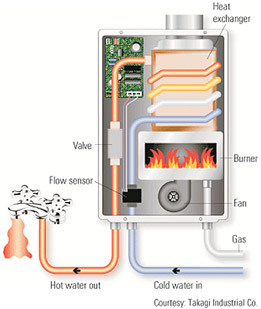 Tankless Water Heaters use NO pilot light, the gas powered version use electronic ignition so you’ll save the gas normally used to keep a pilot running. Because of their small size many homeowners opt to put them outside which allows there former hot water closet to be turned in to an actual closet for more storage room inside the house! Ask us about state or gas company rebates for installing tankless water heaters. These super-efficient Tankless Water Heaters are available for all applications. If a Tankless Water Heater sounds right for your hot water demand just give Clean Plumbing a call at 714-402-7079. Gas valve failure, ignition failure, inconsistent hot water (due to faulty/defective heater), ventilation caused carbon dioxide problems, pressure relief valve problems, drain valve leakage problems, leaky main tank problem (mold problems if not caught early), inspect your water heater every 6 months, rust in hot water, corrosion of pipes on top of heater, water heater noise, low rumbling or popping build of minerals from the water in the bottom of the tank. No real way to open, break up or remove from residential water heaters.